Neptune's Ocean Discovery Jumper is rated 4.6 out of 5 by 28. 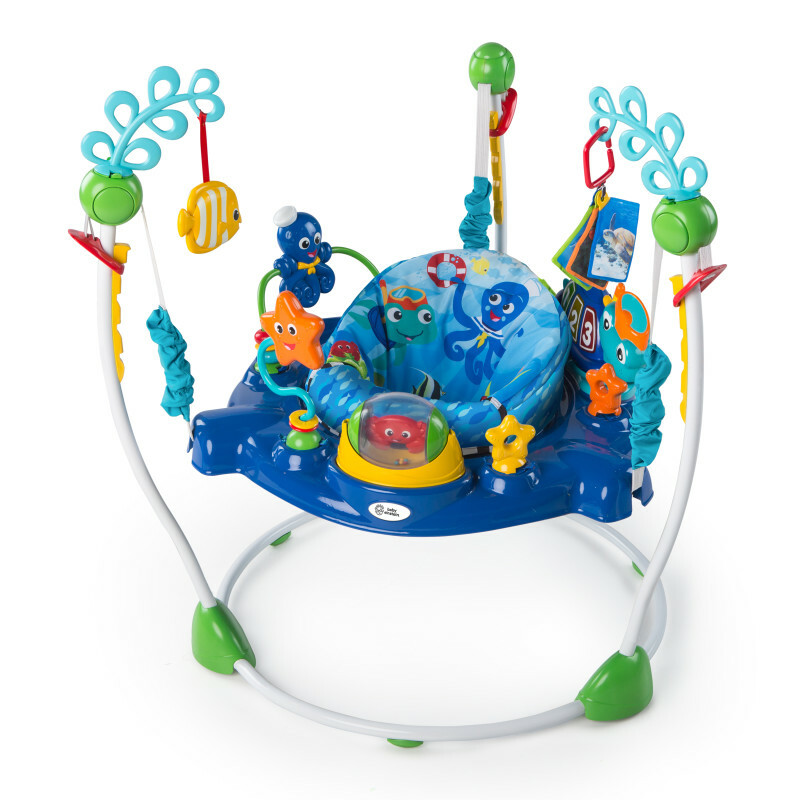 The Baby Einstein Neptune’s Ocean Discovery Jumper gives your baby 360 degrees of engaging activities with a splash of underwater wonder. Your mini-marine explorer can embark on a playtime expedition and swivel from toy to toy in the height-adjustable baby bouncer. There's a crab that spins inside a clear ball, a little starfish that holds a self-discovery mirror, an octopus paddle toy, and flash cards with real underwater imagery to boost vocabulary. The removable sea turtle activity center helps your baby discover numbers and colors in 3 languages (English, Spanish, and French). With extra link loops, you can also add your baby’s favorite toys or swap out fresh ones for a new ocean of discovery. The baby bounce chair allows your little one to jump and dance, which helps strengthen their developing leg muscles. With no doorways required, you can watch your baby safely play and grow wherever you need to be. Rated 5 out of 5 by May from Life saver! Absolutely love this product. Best money we have ever spent. I take them everywhere with me. Being a mom of twins they are a life saver. They babies not only love them but I love them also. It keeps them active and keeps them from always getting into stuff. Rated 5 out of 5 by Baby Einstein Ayden from Jumped himself to sleep! This item has three languages which automatically made this a must have! It was delivered at 1:00pm, assembled by 1:15pm and by 2pm, he jumped himself to sleep! Rated 2 out of 5 by Candice from Toy was missing!!! So excited to setup and use this entertainer! Unfortunately, a major toy piece was missing. The big star :( Highly disappointed as I believe it was missed in packaging. Now we have to return. Rated 5 out of 5 by bnabb8 from Love this Jumper! My family loves the Ocean Discovery Jumper! It was easy and assemble and made well. My baby loves looking at all the bright ocean toys attached to jumper. Very entertaining, even my 2 year old wants to help brother play with the attachments. Also, doesn't take up too much space which is a plus. Rated 5 out of 5 by Jennalwoodall from So fun! My daughter LOVES this jumper! She enjoys it, plus it totally helps this mom get some things done around the house!!! Rated 5 out of 5 by Kayrock from Love this product Great product my little one loves it. I also like the fact you can take the turtle off and he can play with it by itself.